« Winter Mushroom-Barley Soup: It's Creamy and Glorious! I changed this a bit from the original — I added olive oil, the sausage and the roux. 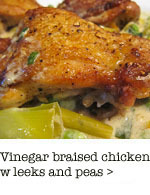 I also used chicken broth in this version (mahahahaha, Vegetarian Times!) rendering it meat-laced and definitely un-vegetarian. You can use vegetable broth if you’d like. Preheat oven to 375 degrees. Lightly oil a 2-quart baking dish (or use non-stick spray). 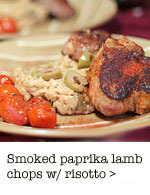 In a saute pan, heat the tablespoon of olive oil over medium-high heat. Add onion and saute, stirring until onion is soft, about 2 minutes. 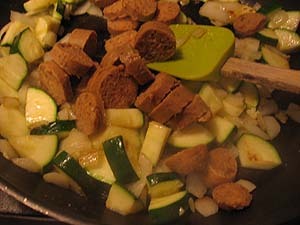 Add the garlic, zucchini and sausage. 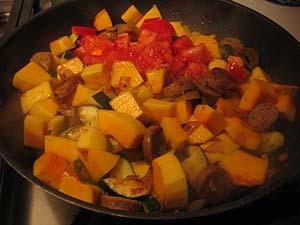 Continue to cook until it all gets a little color and starts to look tasty. Next, comes the pumpkin or squash and the tomato. Add it all in and stir a bit. Let saute for about 5 -6 more minutes. Then, add the butter and let it melt. Sprinkle in the flour and combine. 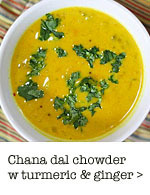 Cook it for just a minute to get rid of raw flour taste. Add the sherry and broth. Stir and let it all thicken up. Set the pan aside and cool off just a bit so you don’t scramble the eggs. You can also temper the eggs with just a little bit of the sauce in the pan — I think I did that in addition to letting it cool for about 5 minutes. In a medium bowl, whisk together egg and egg whites, buttermilk and yogurt. 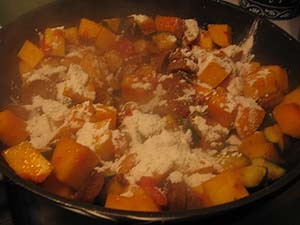 Add feta and spices to the sauteed vegetables and then the yogurt/buttermilk combination. Season with salt and pepper. Mix well. 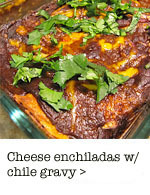 Spoon into a loaf pan or square casserole dish. 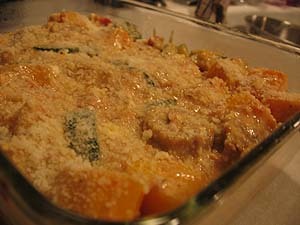 Sprinkle with the Parmesan and bread crumbs. Bake 25 minutes or until bubbly. Serve hot. When you spoon it out it may look a little messy. Ehh. That’s just the way it goes. 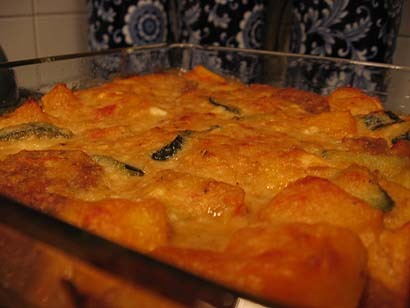 It’s a casserole — a dairy-based casserole — it’s not going to photograph well or look magazine-perfect. It’s kinda going to gloop out onto your plate. But, it’s great tasting, so who cares if it’s not super pretty? Not me. Next Friday will be a Sugar High Friday…on a Friday! Hooray! 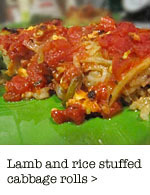 I was kind of -meh, pumpkin, when I started reading this, but now I totally want to make it. I have a bizarre love of pumpkins (and all Fall/Winter squashes) that runs roughly from August thru March, so I was into it regardless, but I can really say the sausage and cheese definitely makes this dish. 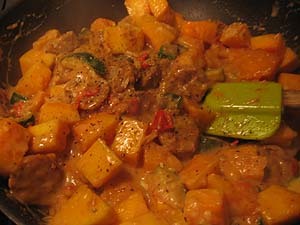 Something about the creaminess and the tanginess and the saginess and the sausageness with the squash is really very good and satisfying. who cares if it was messy, it really looks delicious!